The Cinque Terre and other Italian Riviera towns are popular Italy travel destinations. Here's how to get from Rome to Cinque Terre villages, Italian Riviera towns, and the city of Genoa. Note: Check current train schedules and ticket prices on the Trenitalia web site or the Rail Europe Italy Rail Pass page where you can also buy Italian train tickets online in US dollars. Trains to Genoa: Frecciabianca (fast) trains run between Rome's Termini and Ostiense railway stations and Genoa's Piazza Principe railway station, making the trip in 4 - 5 hours while Intercity trains take about 5 1/2 hours. Trains are currently scheduled about every two hours during the day from about 6:15 AM to 6:27 PM. The Intercity notte, night train, currently leaves from Roma Ostiense railway station about midnight and takes six hours. Book your ticket on raileurope.com. Cinque Terre and La Spezia: From Rome's Termini or Ostiense railway station, take a train to La Spezia Centrale, the main railway station in La Spezia. The same trains that go to Genoa (above) stop in La Spezia, taking 3-4 hours. Transfer to a regional train for the short ride to one of the Cinque Terre villages (see Cinque Terre map). Riomaggiore will be the first stop. During summer you can also take the ferry to the Cinque Terre from La Spezia's harbor. Book your ticket on raileurope.com. 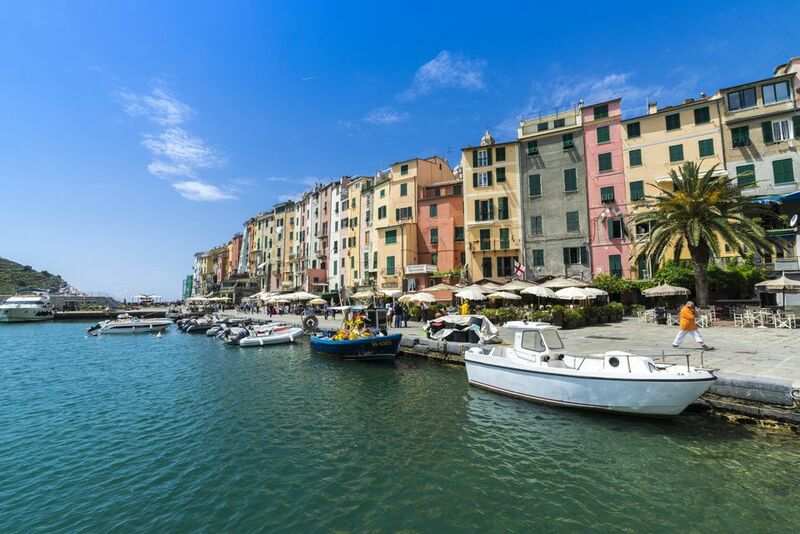 Italian Riviera: If you're going to Italian Riviera destinations with railway stations between La Spezia and Genoa, you'll probably have to change trains in La Spezia and continue on a regional train. If your destination is past Genoa, change trains in Genoa. Currently there's one train a day that runs directly from Rome to San Remo in the afternoon, taking about 7.5 hours. Buses run to towns that aren't on the rail line, such as Portofino and Portovenere, from the nearest train stations. Ferries also connect coast towns from late spring through early fall. The A12 Autostrada (toll road) runs along the coast between Rome and Genoa although for part of the distance it's not a toll road. The A10 autostrada runs from Genoa to the French border. Note: Cars are not recommended for visiting the Cinque Terre as the villages are car-free although there are a few parking lots outside the villages. Find car rentals in Genoa through Auto Europe. Find car rentals in La Spezia through Auto Europe. More Rome Transportation - How to get from Rome to Civitivecchia, Rome airports, and other cities in Italy. Find flights to Rome or Genoa on TripAdvisor.